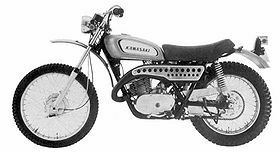 The Kawasaki F5 is a motorcycle produced by Kawasaki from 1970 to 1971. The Kawasaki F5 Bighorn was a 350cc, 2-stroke, dual-purpose motorcycle manufactured by Kawasaki in from 1970 through 1971 and known as the big brother to the Kawasaki F4 Sidewinder, the Bighorn used a newly designed 350cc engine with a 5-speed gearbox and produced 33 hp @ 6,500. The F5 had an enclosed carburetor to keep out water and dirt, and sufficient ground clearance. The F5 was also one of the few Kawasakis to utilize the unique Hatta forks. The Kawasaki F5 currently can participate in AHRMA sponsored events in the Sportsman 600 which are 1974 and earlier machines manufactured as 251-600cc, including like-design models. 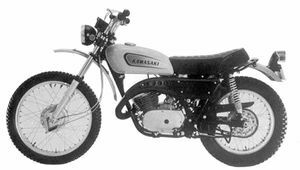 The F5 Bighorn was succeeded by the Kawasaki F9, a redesigned 350cc Enduro style. Remarks: Hatta front fork and muffler cover provide positive identification. Has CDI ignition system, diaphragm fuel tap, aluminum alloy rims and sprocket.